Disclaimer: This is a compensated post in collaboration with Sabra. I am a Sabra Tastemaker and am a part of the #SalsaLove campaign. As usual all opinions are my own. Thank you Sabra for making NJB awesomeness possible! It’s now officially soup and cornbread season in these parts of the world. I can get down with it, give me carbs and call it good. Oh you know I love vegetables but carbs are my life givers lol! Something funny, cornbread and Brussels sprouts are my most popular posts on my site. I find that hilarious, and so true to my personality. I make a mean cornbread, and toasty good Brussels. When I lived in Sacramento, my best friends and I would visit a popular suburban restaurant that served spicy cornbread. You know I was just there visiting the girls and we went to the spicy cornbread place. 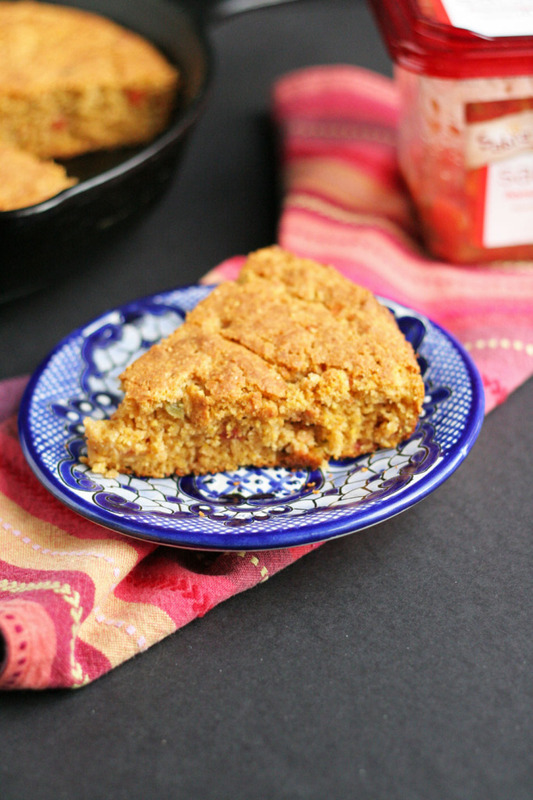 It totally inspired this salsa cornbread recipe. 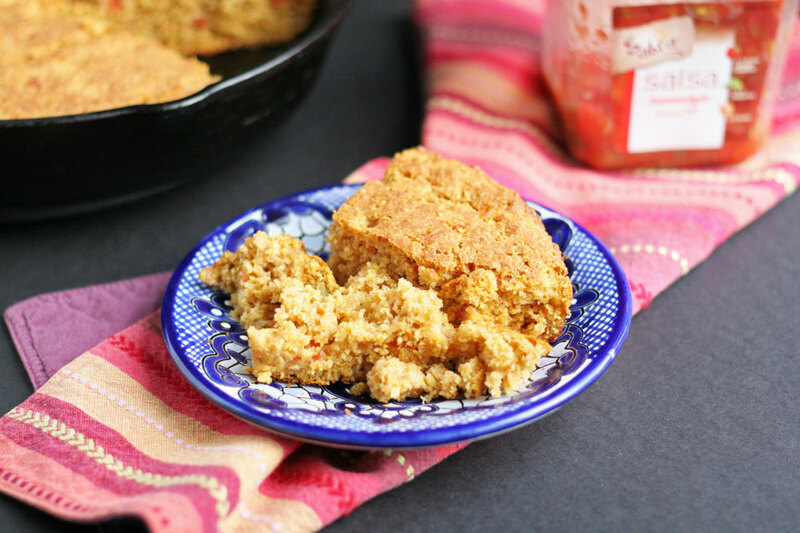 We love the combination of the savory cornmeal fluffy texture of this bread with a spiciness form the salsa. I used the Sabra Homestyle for this, but I would easily use the Restaurant Style, being that it’s my other favorite, and it would be so good too. As soon as I got home, I got to testing and made this cornbread, a big pot of soup and enjoyed the changing leaves, and weather. It’s time for hoodies, boots, leggings, and winter hats. Perhaps a rain jacket from time to time. The green grass is back and the smell in the air calls for more cornbread soup. How’s the weather where you live? Here are some of my fellow #SabraSalsa Tastemakers recipes using their favorite salsas. We met on the Sabra Tomato Farm Media Trip earlier this year. To think it’s been three months since that trip, crazy how time goes. Deb and Rod from Smith Bites interviewed us, and got us to sing to the tomatoes, and then made a video of it, check it out! I loved meeting all of these amazing bloggers, learning from each other, it was a great trip. 1. Add cornmeal, flour, baking powder, and salt into a large bowl. 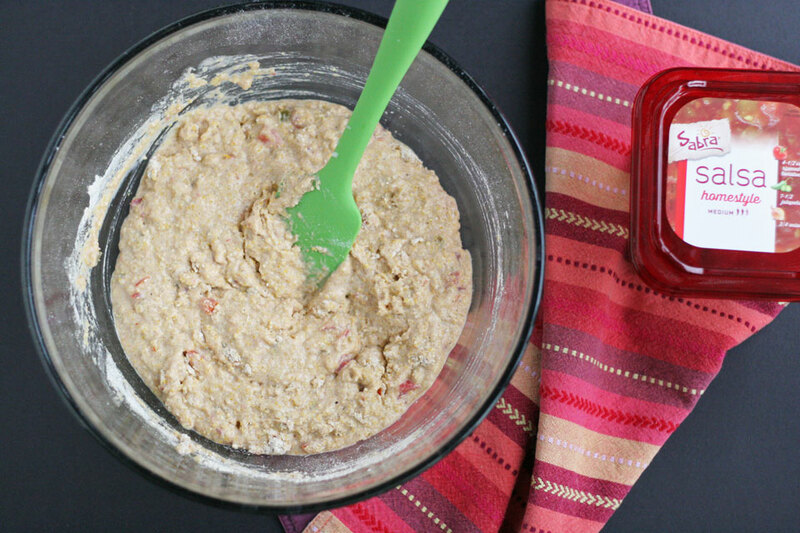 Whisk milk, salsa, egg, and butter together. Add milk/salsa to cornmeal, mix using a spatula. Do not over mix. Combine until the dry ingredients come together with the wet. Leave the batter lumpy. 3. Grease with butter very well: 10 inch cast iron pan, or 8 inch pan, or a 9×13 pan if doubling recipe. Pour batter into pan, place in oven and bake for time needed, check below. ~For a 10 inch cast iron skillet: bake for 25 minutes, use a toothpick at 20 minutes to test the center of the baking dish. When the toothpick comes out clean the bread is ready. ~For an 8 inch pan: bake for 20, use a toothpick at 20 minutes to test the center of the baking dish. When the toothpick comes out clean the bread is ready. ~For a 9×13 pan: bake for 30-35 minutes, use a toothpick at 30 minutes to test the center of the baking dish. When the toothpick comes out clean the bread is ready. Let cool for 15 minutes before cutting into the bread. Other awesome recipes I have worked on with Sabra Salsa! What a great idea! I’ve never though of adding salsa to cornbread, but I’ll bet it would taste so good when dipped into chili. I am actually making it again this week with chili! Thank you :). I love the sound of this corn bread!!! I could eat the whole skillet myself. Oooh, I’m thinking this cornbread with a chipotle chili I make would be a perfect combo. It sounds amazing ! Oh good call on that! It sounds super good right now. 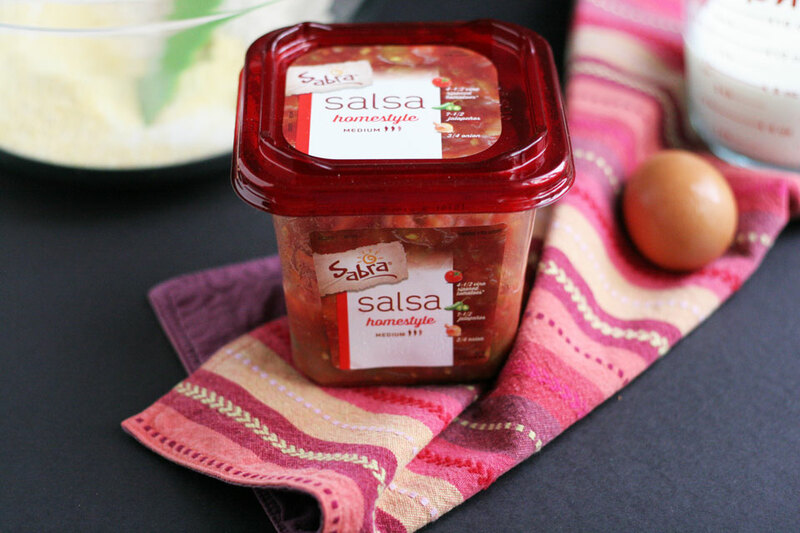 Oh my gosh, I had no idea Sabra had salsa!! Now I need to go back to the grocery store and find it! 🙂 Great looking recipe! They do! And it is so good :). Thanks for the shout out! The cornbread looks awesome. Now you just need a pot of chili! Olga @ MangoTomato recently posted..How To Decorate A Pumpkin Without Carving: Use Nail Polish!